I first visited Manchester 25 years ago this week, en route to a Rush concert at Stafford’s Bingley Hall concert venue, and I was there again 11 days ago, to see Rush at the MEN Arena on their 30th anniversary tour. I hadn’t been to Piccadilly Station since 1980, when I spent a memorable night walking the streets of Manchester between there and Victoria station, to pass the time before the first train to Huddersfield where I was at University! And I must say I barely recognised Piccadilly Station at all when I arrived there, at around 1:30pm – unsurprisingly, it’s changed an awful lot in the last 24 years. I noticed a few Rush fans in 2112 t-shirts, and felt the same sense of community that we used to share in the ‘old days’, when Rush toured the UK frequently. Small groups of Rush fans would turn up at the nearest railway station to the concert, and we’d wave a greeting to each other or share concert stories, worshippers of the same cult congregating in distant cities. 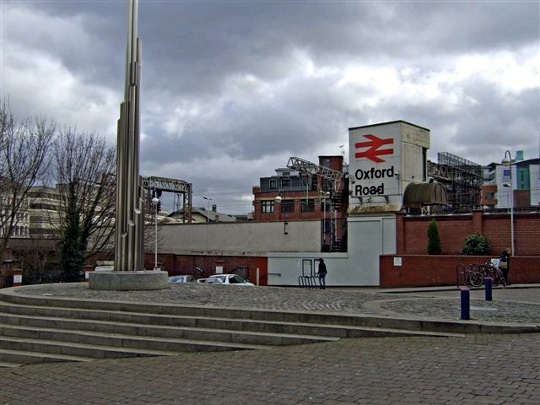 However, this time I was keen to get out of the station and acquaint myself with the City of Manchester again, having spent far too long away – so I ignored them. I dug out my street map and left the station to head for the Palace Hotel, walking along Piccadilly and Oxford Road. I’ve visited Manchester only four times in my life, and hadn’t been there since 1993, but I hoped I would recognise its streets. Oddly, I didn’t at all. I checked into the hotel – quite a grand place, with a huge, very traditional foyer – and took the lift to my room. It was quite large, with a thoroughly adequate ensuite bathroom, and an unusual external wall straight out of the early industrial age, looking very much like part of a Victorian railway station with ancient white tiles and a huge arched window. I opened the (opaque glass) window for a quick look at the view, but found only what looked like a disused canal and the side of another building. I showered and changed, and headed for the Moon Under Water pub on Deansgate, where several dozen other Internet Rush devotees and I had agreed to meet for a few pre-concert beers. Fantastic to meet so many of my Internet pals in person at last and I was quite touched by the number of people who wanted to meet me. We drank for England (or Scotland, or Ireland, or ..) and had a thoroughly good time. At 7:25pm or so, we left the warm, congenial confines of the pub to set off for the arena, ten minutes’ walk away. I’m not a big fan of arena concerts, but as enormodomes go, the MEN does have a good atmosphere and acoustics. And this time, I had quite a good position. At around 7:40pm, the lights went down, the crowd roared, the band took the stage. They opened with the R30 Overture, a stunning medley of moments from classic ’70s Rush music – it worked brilliantly and the whole crowd lost it! The roof nearly came off the arena. Everyone was shouting, cheering, crying as the divine power of some of the most exquisite, capivating, highly-charged music known to humanity exploded from the stage. It was extremely emotional; not a dry seat in the house. There were to be a few more wonderful moments in the set, and overall it was a great gig – but it must be said the selection of material (is this becoming a recurring theme?) left something to be desired. They performed almost half of the godawful Feedback record, and some of their most forgettable, or tragically unforgettable original music in an overlong set lasting three hours, including an intermission and (oh no ..) a drum solo. Yet the only two truly outstanding Rush songs of the last 15 years, the excellent Test For Echo and Totem were both omitted. ‘World of the unlikely and bizarre’ indeed. Nonetheless, the highs (Red Barchetta, Mystic Rhythms, Between The Wheels, By-Tor, the extraordinary R30 Overture and a couple of others) more than made up for the lows. Some of the older material was accompanied by archive photos of the band from long ago drifting nostalgically across big rear-projection screens behind them as they played, to very powerful emotional effect. I left feeling contented and slightly elated. I was amused, by the way, to see a few teenage Rush fans at the concert. I suppose they can’t really be blamed in some respects, because popular music culture seems to have come to a virtual standstill, if it’s not actually moving backwards. But how sad, at that age, to be an enthusiast of a band which, truth to tell, had its day over two decades ago. Thankfully, these adolescent archaeologists of progressive rock music were few in number, and of course it’s quite possible that the less unfortunate of them do appreciate some of the music of their own time as well. I walked back to the hotel from the arena. On the way I passed a huge flat-panel TV screen mounted on the side of a building, showing a local news story or documentary about the Moors Murders; I suppose they cast a perpetual dark shadow over the city. Oh Manchester, so much to answer for. I lay awake for hours. 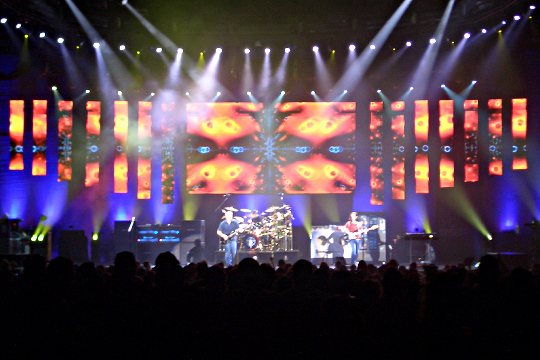 My head was buzzing from the concert, memories of Rush concerts I’d attended years ago, and someone I’d met earlier, too briefly, in the evening .. she floated across my thoughts rather like the nostalgic images had floated across the screen at the arena. But I must have slept eventually, because I woke up, at about 8:30 AM. I showered and dressed fairly slowly; plenty of time before my train. I drank coffee, checked out, and walked to Manchester’s Oxford Road railway station, conveniently located a two-minute walk from the hotel. I had a 20-minute wait for my train, and I sat on one of the benches, watching a small bird hopping up and down the disused platform opposite, occasionally fluttering its wings slightly. A black cat came running along the platform, leaped on it, and killed it. The cat trotted smugly back along the platform in a slightly more self-satisfied manner than was necessary I thought, its quarry hanging limply by the throat from its jaws, wings pitifully half-extended from its vain attempt to escape. This entry was posted in Uncategorized on September 23, 2004 by admin. 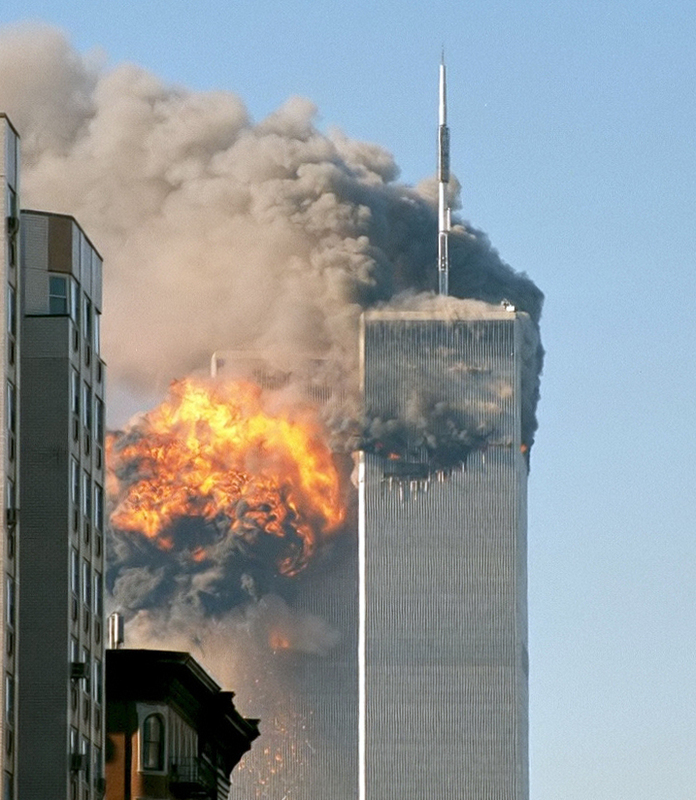 Lots of references to 9/11 in the media today, the third anniversary of the most audacious terrorist atrocity in history. Thousands of people lost their lives on that day of course, but what’s too often overlooked is that many thousands more innocent lives have since been destroyed in the cynical foreign adventures for which 9/11 provided an excuse, and which our own government has so shamefully aided and abetted. Unlike the victims in New York and Washington, the coalition’s innocent victims in the Middle East have no remembrance ceremonies, no special day – so I spare a thought for them today, as well as for the victims of 9/11. The terrorist leaders must have taken an opportunity today to look back over the last three years with a measure of satisfaction. So far, regrettably, the governments of the United States and the United Kingdom have played into their hands beautifully. This entry was posted in Uncategorized on September 11, 2004 by admin.